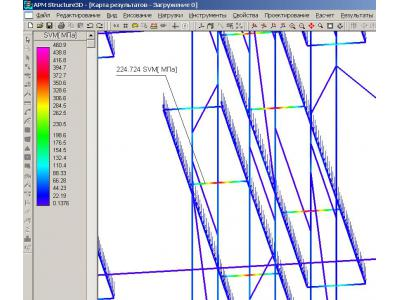 Strength calculation of racking systems for Orekhovo-Zuyevo experimental machine-building plant "Transprogress"
Orekhovo-Zuevo experienced engineering plant "Transprogress" specializes in the design and creation of rack designs. 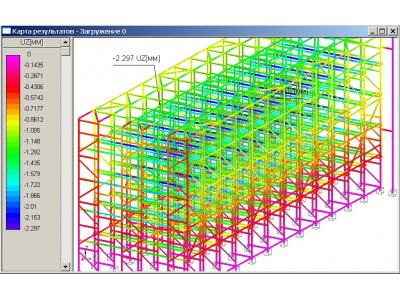 By the order of Orekhovo-Zuevo experienced engineering plant "Transprogress", a series of strength calculations shelving structures, the appearance of one of the computational models which are shown in the figures below. Most of the calculation of shelving construction was carried out in an interactive mode with the plant "Transprogress" - if any profile design does not satisfy the conditions of strength - quickly offered a different profile from the rolled metal available in the enterprise. 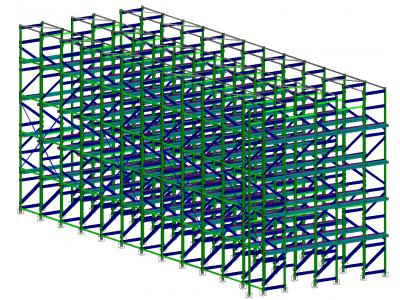 The design consists of a series of racks, the rack is made of a bent open U, equilateral 60h80h4 GOST 8278-83, and cross beams and bracing struts of other standard and non-standard profiles. Bearing cantilever beams rigidly attached to the posts, and the individual racks are connected to each other by means of the runs. When calculating the racking design took into account its own weight and the weight of the load that fills the shelves of the rack, lying on the transverse cantilever beam. In the static load were all based in one uploading, since the structure is located indoors and wind and snow loads do not act on it. Map equivalent (von Mises) stress is seen that as compared with the yield point of the material stack (St3kp) there is a significant safety factor, i.e. design is quite efficient. A comparison of the maximum permissible deflections with GOST 28766-90 "Racks. Bases for "showed that the rack structure is of sufficient rigidity and additional reinforcements are not needed. 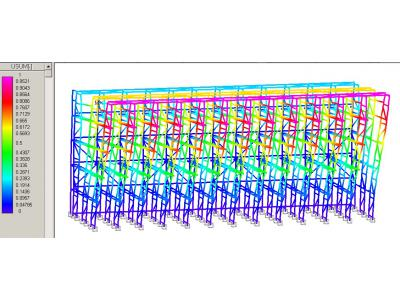 The value of the stability margin calculated structure factor greater than 6, allows to conclude that the rack structure is quite efficient and can be implemented.